So you've already got something borrowed, but what about something blue? This is a perfect theme for any wedding occasion! Whether you're planning an upcoming bridal shower, bachelorette party, rehearsal dinner, or wedding reception, our adorable Something Blue Mod Party Kit is the perfect all-in-one accessory for your event. Sit back, relax, and leave all the decorating to us! This party-ready kit is filled with precious wedding themed accessories adorned in blue, making your special event stress-free! No need to match every hue of blue under the sun when you can buy our kit and have nothing but fun! From stylish blue water bottle labels to tasteful menu cards, we have everything you'll need in one perfect kit! 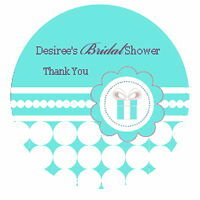 Blue patterns and designs are printed on every piece to compliment your wedding theme to a tee. From a ring from your love so true, to cupcakes, and "I do", we have just the designs for you! Simply add your guests and goodies and your party is ready! You can further customize your event (for an additional charge) with our coordinating 2" round personalized labels perfect for personalizing any extra party favors! Simply add your names, date and/or personal message to fashion an exclusive event! Celebrate your love with a classic Something Blue theme with the help of our all-inclusive modern party kit!